Sleep is probably one of the most important elements of maintaining my mental health. When I don’t sleep my coping skills go straight out the window and it impacts all of the important areas of my life. My performance at my job becomes lousy and all of my relationships start to deteriorate. I have made it a priority over the years to get plenty of sleep every night and it has made a huge difference in my mental well being. 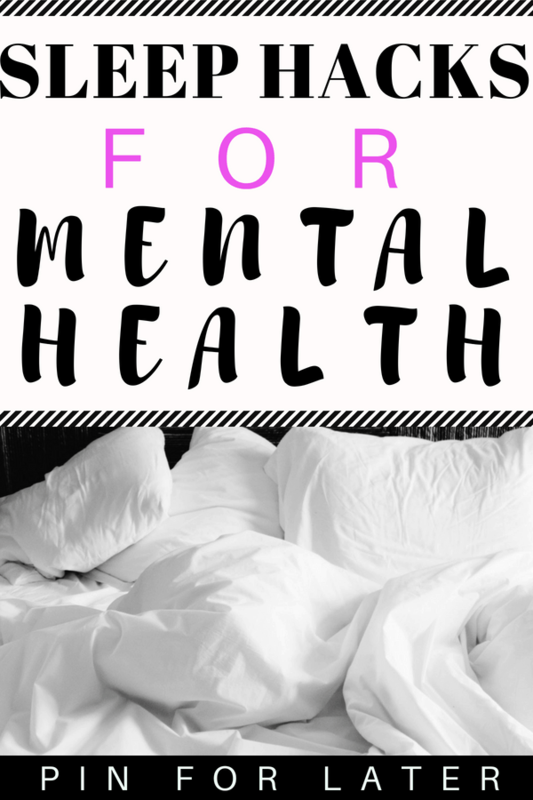 Studies have shown that in addition to being a symptom of mental health issues, lack of sleep can actually cause depression, anxiety and other health disorders (read an article about it here). 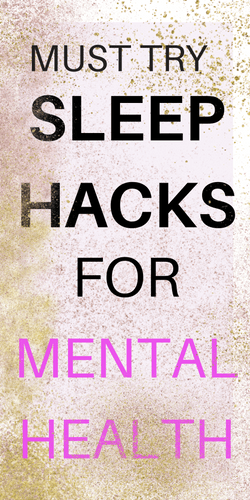 Here are five sleep tips for mental health to step up your nighttime game and become a sleeping master. I’m sure you’ve heard this but it really does make a difference. If you’re like me and you struggle not to look at your phone at night install an app to lock it during the hours you should be resting. You can also try charging your phone away from your bed or in another room. I try to make it a habit to read a book before bed. I’m also guilty of waking up in the middle of the night and looking at my phone instead of trying to go back to sleep. The light from your phone signals your brain that it is time to wake up which makes it even more difficult to fall asleep. On top of that, I usually get sucked into reading the news which makes gets my brain charged up and makes it even harder to sleep. I use the Flipd app which lets me lock myself out of all my social media and news apps at night. That way I’ll be less tempted to start messing around on my phone in the middle of the night and I can try to get more sleep. This is a huge one for me. I wake up every day at 6 am and try to be in bed by 9 pm to give myself time to read, journal and fall asleep. I have found the key to getting up early is to wake up freaking early and stay awake all day. If you nap during the day you are not going to be able to get quality sleep at night. Try to go to bed at the same time every night and don’t drink caffeine late in the day. I try to maintain my sleep schedule during the weekend to avoid feeling like garbage on Monday. Get into bed at least an hour before you want to actually go to sleep. This is a great time to read or write you affirmations and do some gratitude writing prompts in your journal. I also like to visualize how I want to feel in the morning and try to get excited for the next day. Before I go to sleep I think “tomorrow is going to be a great day, I can’t wait for it”. This helps me wake up in a positive mood in the morning. 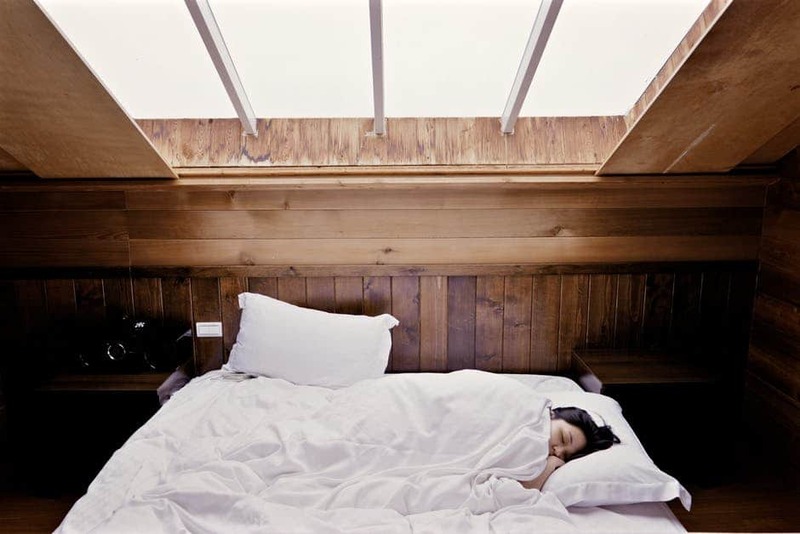 If you are having trouble sleeping find a way to relax before bed. Right now I like to write in my journal but I have also used meditation and yoga in the past. Try different things and see what works for you. Sometimes I like to listen to the sleep episode of the meditation podcast (click here) or I will read a book or take a long bath. For more relaxation ideas check out my relaxation Pinterest board here. If you tend to wake up in the middle of the night to go to the bathroom (is this just me and my tiny bladder?) avoid liquid after 6 pm. You should also avoid alcohol in general. 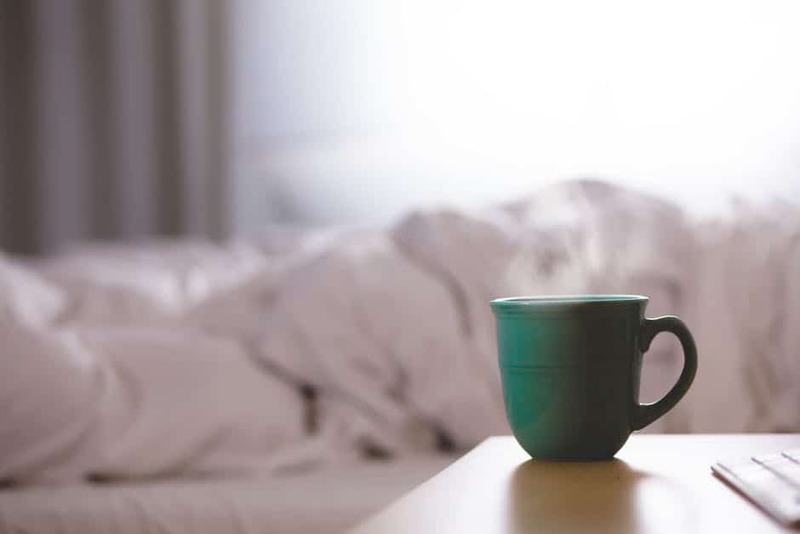 Alcohol can help you fall asleep faster but the sleep that you get is less restful (click here to read what alcohol does to your sleep). If you’re having trouble sleeping also try laying off the caffeine. Drinking coffee late in the day can end up keeping you up at night. Your bedroom should be only for sleep. Remove the TV and try to do everything that is not sleeping in the living room or other areas of your house. You want to train your brain so it knows when you are in your bedroom you are going to sleep. Make your room slightly cool at night and use blackout blinds to make it as dark as possible. Light signals to your brain that it is time to wake up. If you don’t have curtains try a sleeping mask. If you find you are being woken up by noise try adding some white noise like a fan or a sound machine. There are tons of free white noise apps you can use on your phone. Try to make your bed as comfortable as possible. When I couldn’t afford a nice mattress I bought a thick foam pad from Target that added extra padding. Get a soft comfortable blanket and nice pillows for your bed. You want to make it as cozy and comfortable as possible. 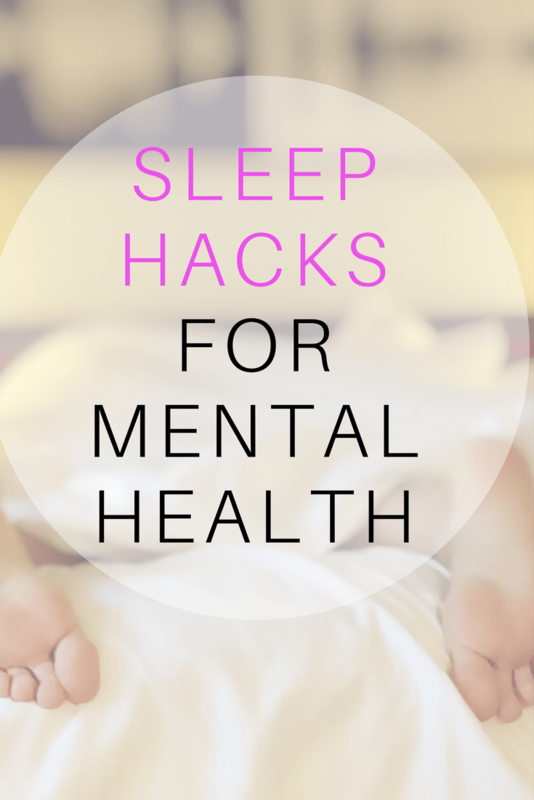 For more ideas on getting better sleep check out my sleep Pinterest board here. Want to remember these tips for later? Pin it to your favorite Pinterest board! I definitely think not drinking water after a certain time at night (depending on when you go to sleep) is a really smart idea. I freaking always used to have to get up during the middle of the night to pee and it was so frustrating! 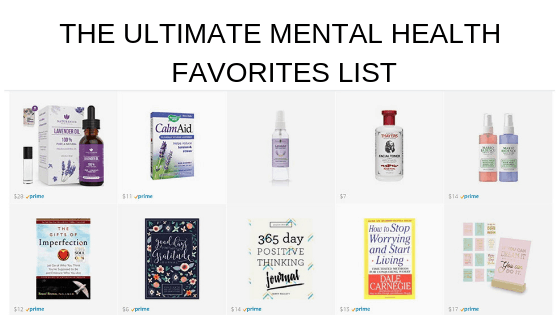 Thank you for all of the sleeping tips for mental health. I have been having a lot of trouble sleeping lately and I don’t know what to do. I like your tip about making sure your bedroom is only for sleeping. I will have to try and remove things in there like my tv. I didn’t know that sleep is probably one of the most important elements of maintaining my mental health. My sister is having a hard time sleeping because of her anxiety. My mom suggested trying counseling for mental health and shared this article with her. I hope your sister finds some relief soon <3 getting good sleep definitely helps me manage my anxiety. Thanks so much for visiting my blog and sharing with your sister.